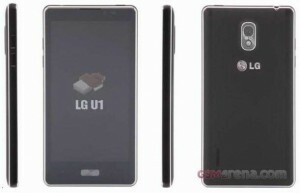 LG Optimus U1 will be surely the first handset of LG which will run on Android 4.0 Ice Cream Sandwich operating system. Now this handset has exposed on the web along with its specs. According to recent reports, U1 Optimus will hit the South Korean market next year. Check specs of it below. LG Optimus U1 ICS Android phone is featured with a 4+ inch touchscreen. On board you will find a rear and front facing snapper. Rear camera will bring the feature of LED Flash. It will also come with a 3.5mm audio jack.